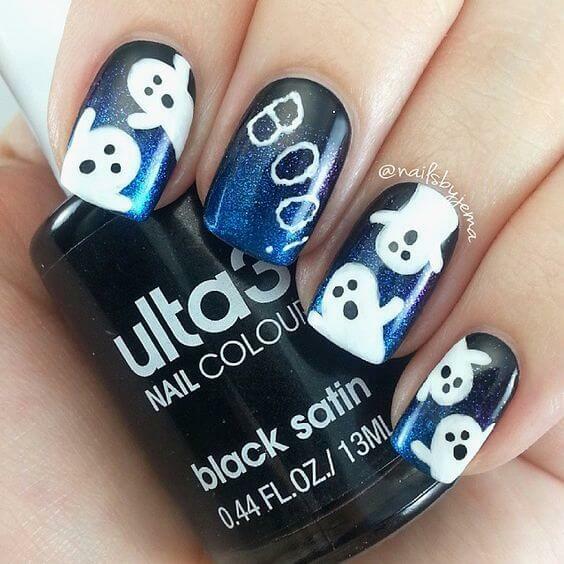 What would be a better accompaniment for your Halloween costume than some cute or spooky Halloween nail art? Halloween is one of those Holidays where you can be as quirky and creative as possible and people won’t judge you. 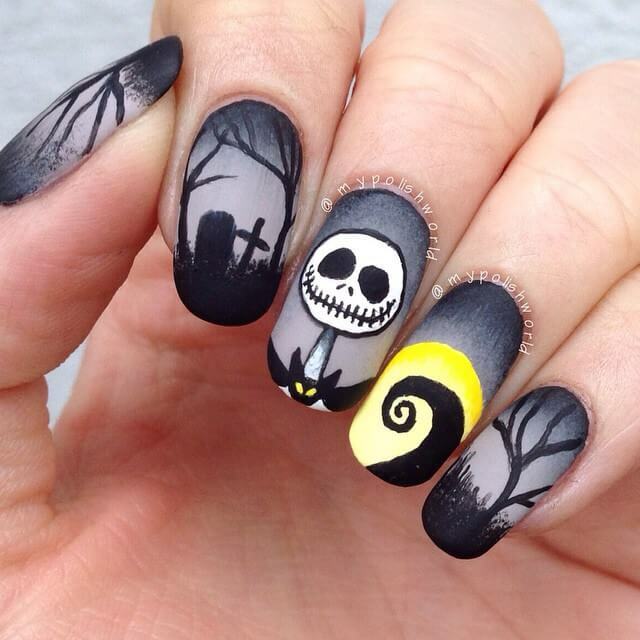 And when it comes to nail art, there are a plethora of themes and ideas, you can choose. 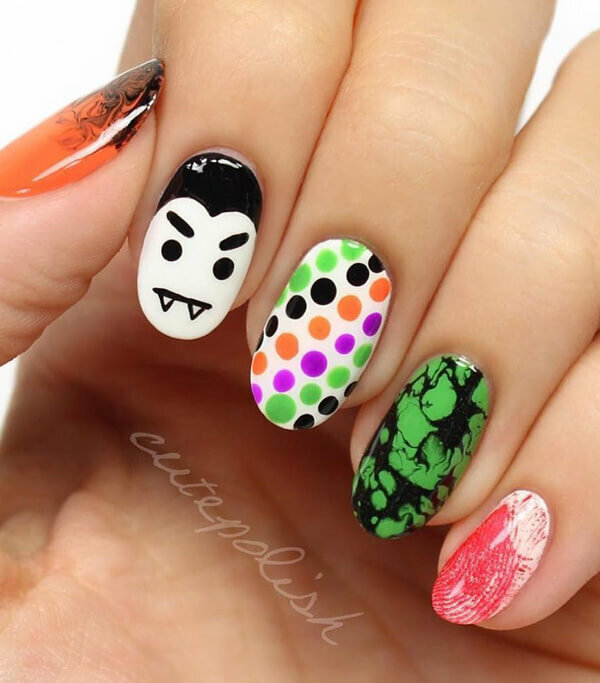 Alternatively, you can even try nail art that goes with your costume or the character you’re portraying. 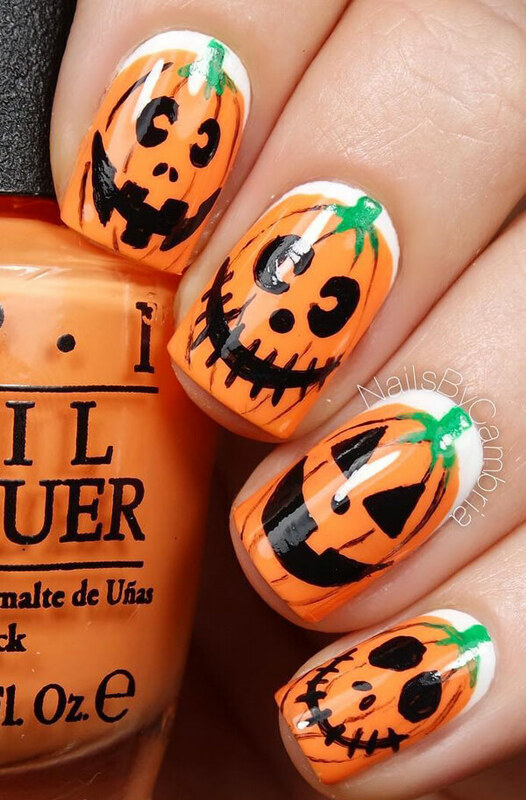 Below we’ve shortlisted some of the most stunning Halloween nail art ideas for you. 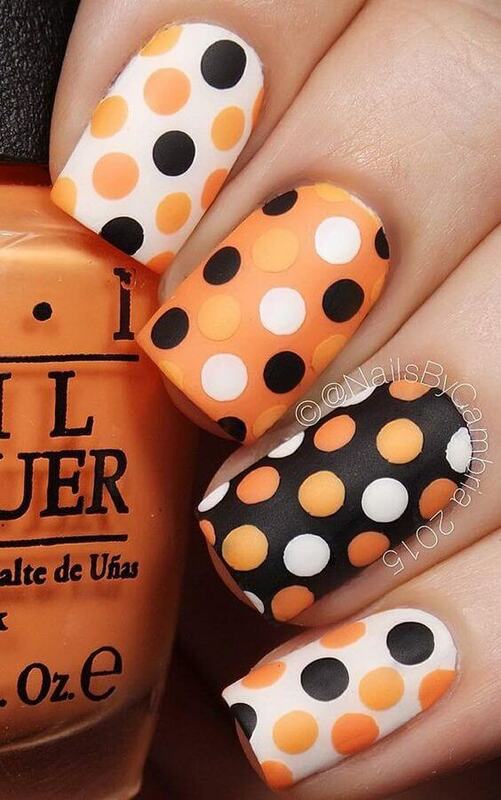 To get yourself into the Halloween spirit, decorate your nails in quintessential Halloween colors like orange, black and remind. It will remind everyone of the Jack-o-lanterns. 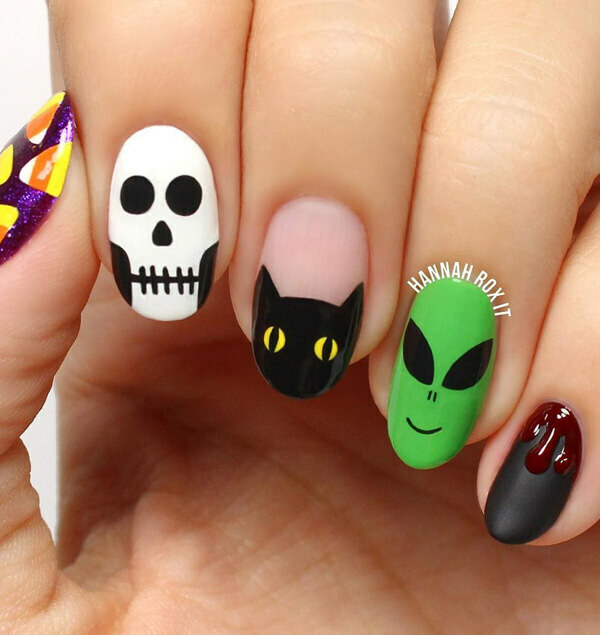 This creepy, yet extremely stylish nail is in no way difficult to achieve. And the black and white color combination is always a classic. 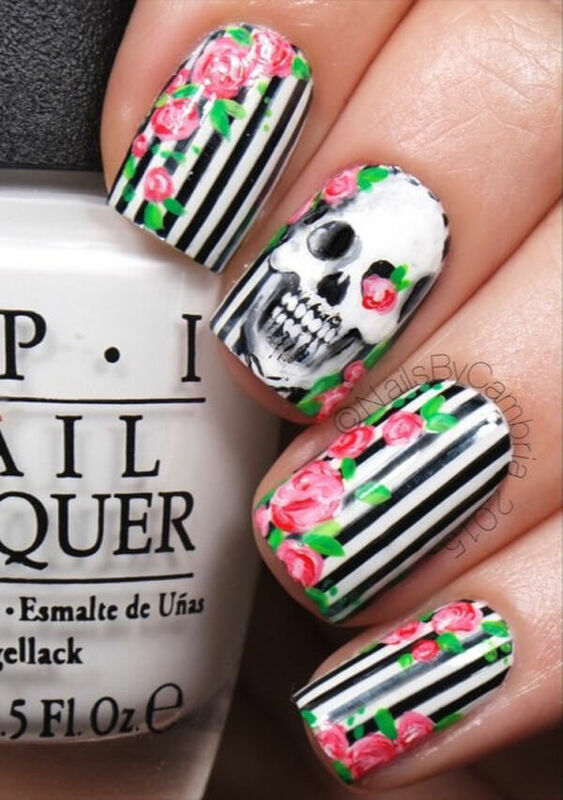 If you want a balance between badass and cute, opt for this skull with floral pattern nail art. It’s sure to make you stand out from the crowd. Witch’s feet prop is one of the most common ideas people incorporate into their Halloween decoration. 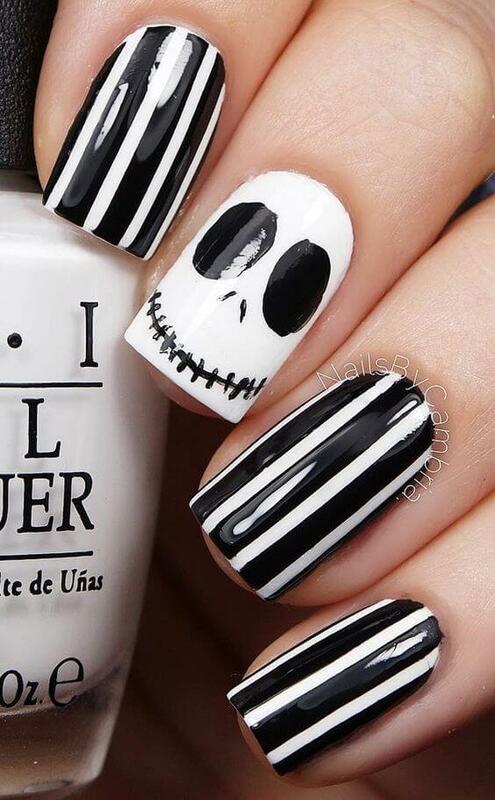 So why not make use of the same for your nail art as well? 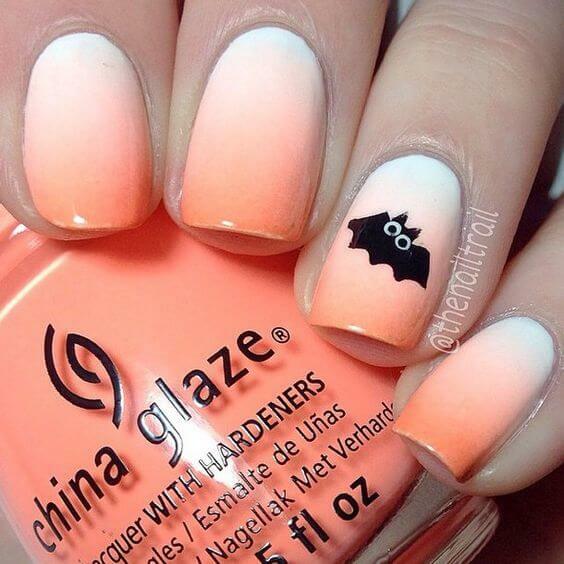 If you like to keep things understated, you can go for this ultra feminine, yet appealing Halloween nail art. 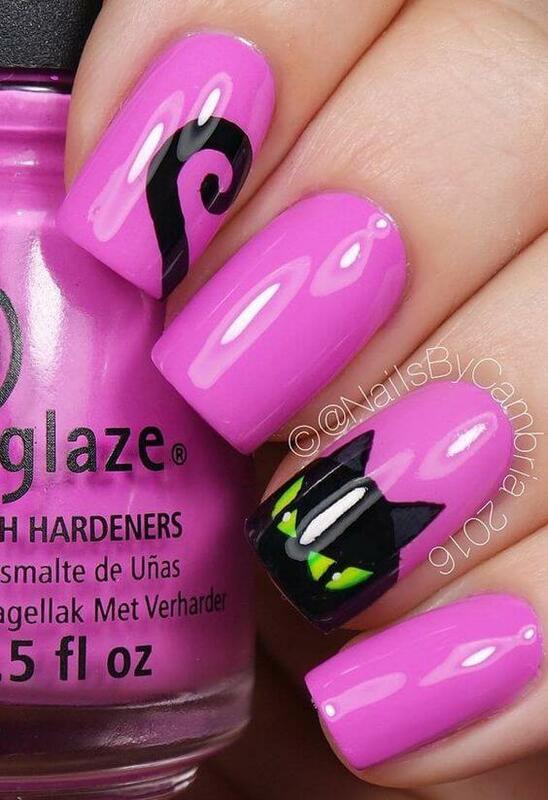 This one’s a relatively easy nail, with just one statement nail, which features a black cat with creepy eyes. This one looks so cool and fun. 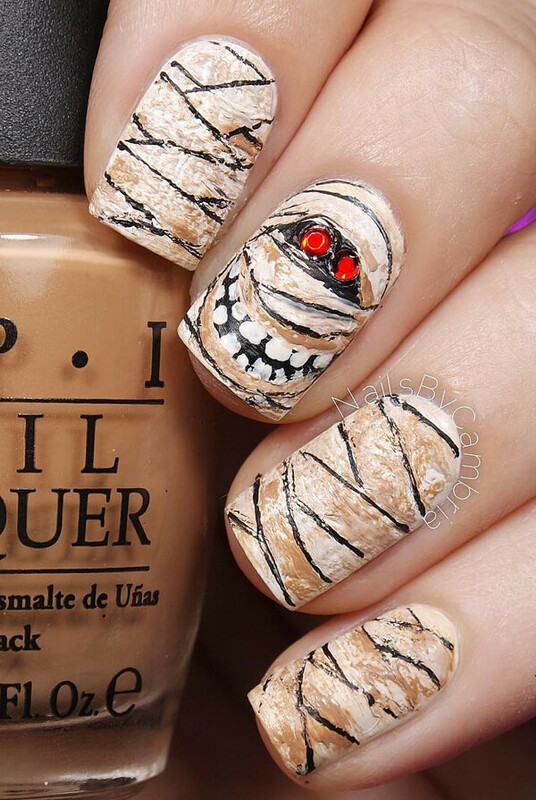 Colorful nail arts pair best with white, so opt for something similar while donning a mummy costume. It seems like someone stabbed the nail and it’s oozing blood out of it. The ornaments are doing full justice to the nail art. 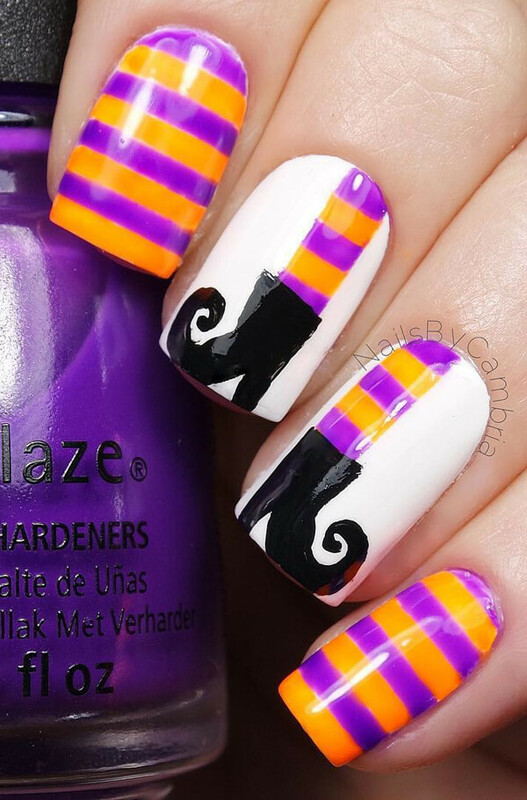 Here’s another neat and clean Halloween inspired nail. We loved the pinky finger one, with black base and blood droplets the most. What about you? 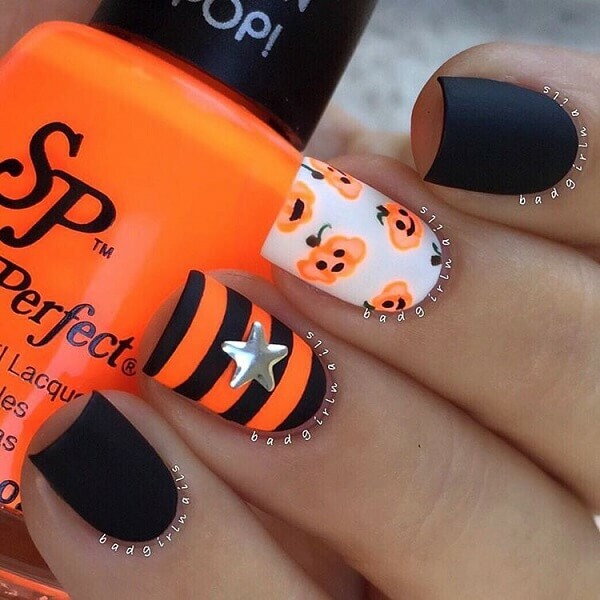 Since Jack-o-Lantern plays a crucial role in Halloween, both in decoration and for freaking out people, how about use the same idea for nail art as well? You can even make use of tiny ornaments for decorating your nail art. The one featured here is quite badass, with all the blood shots and pierced heart. 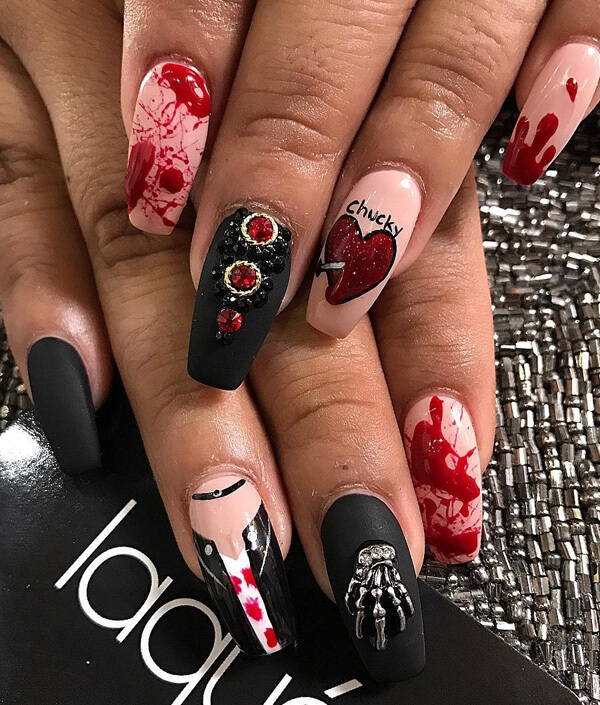 Here’s a gothic, graveyard nail art to inspire you. 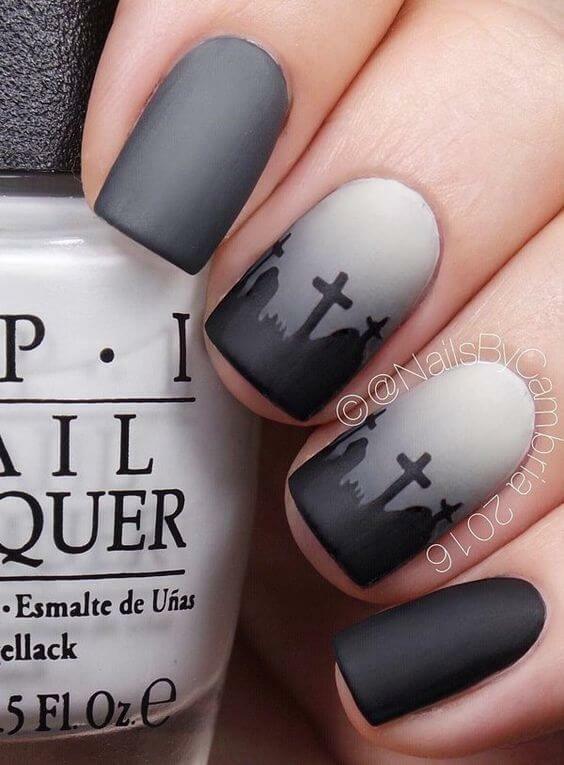 We love the gradient of gray shade used in this nail art. 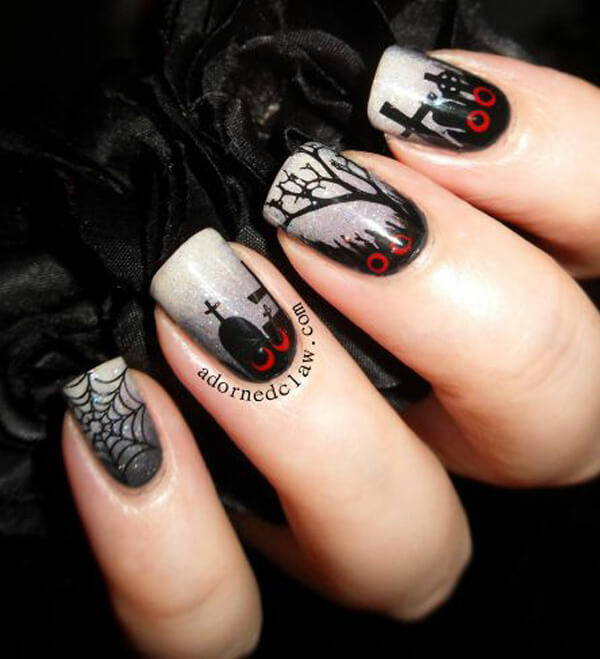 A complete Halloween night scene with graveyard, full moon, ghost and barren tree is depicted in this nail art. Do you think these cute, little ghosts can even scare anyone? We don’t think so. They are just too adorable to freak out anyone. This one is seriously creepy and even unique. And hat’s off to the blogger for this creative and out of the box idea. It’s seriously our top pick. These pumpkins seriously look really adorable. And the star sticker is also complementing the nail art really well. 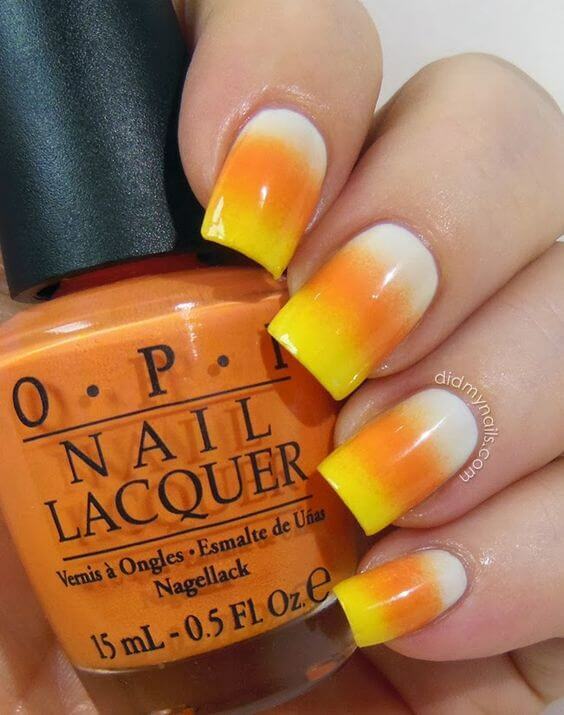 This ombre nail art inspired by candy corn is making us all hungry. And it’s going with the theme too. Graphic designs on the nails are in and going by the looks of it, we don’t think it will go out of fashion, at least for this year. 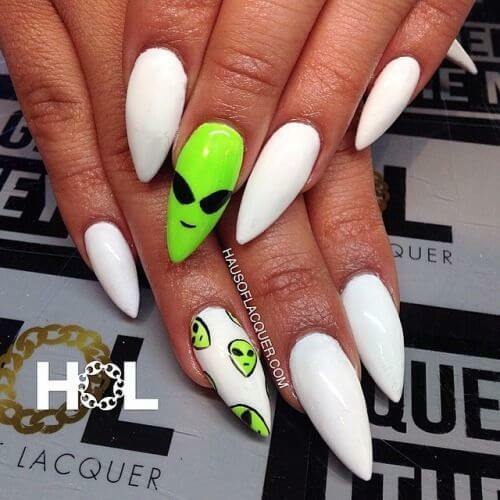 This alien nail art is really sassy and cool. First and foremost, we absolutely adore the color combination. It’s really fresh. Secondly, the shape of the nails is also different. 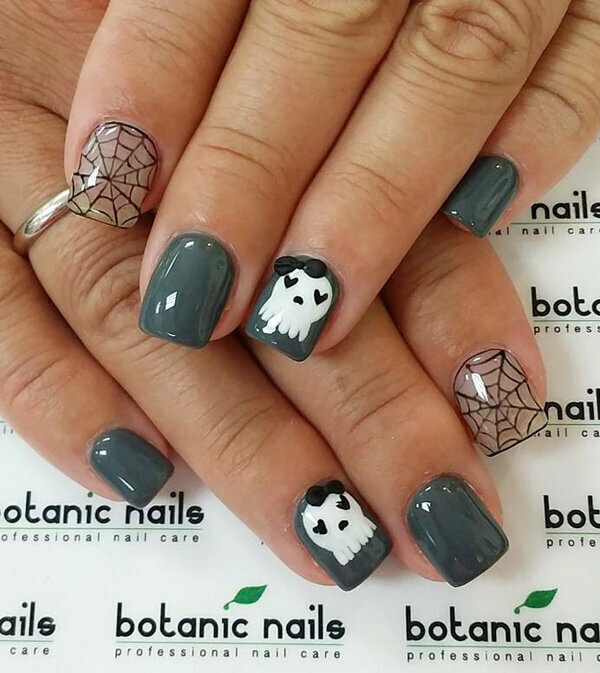 This nail art is a bit different as it has not one, but one statement nail art, one is of a cute ghost and the other is of a spider web. The bow on the ghost looks adorable. Aww! That’s an adorable skeleton couple. The red bows are suiting the black really well. And it’s a welcome break from traditional red and black too. Look at this cute little ghost? Seems like his heart has been, and that’s why he’s become so upset. Is there anyone who can mend his heart? 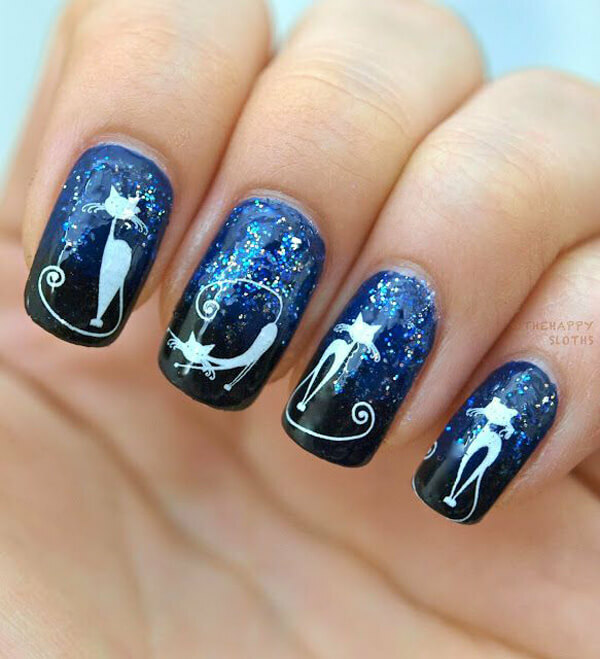 If you have an extreme love for the cats, you can draw them on your nails too. And cats are known to be a bit evil-ish, so they’ll go with the Halloween decoration too. 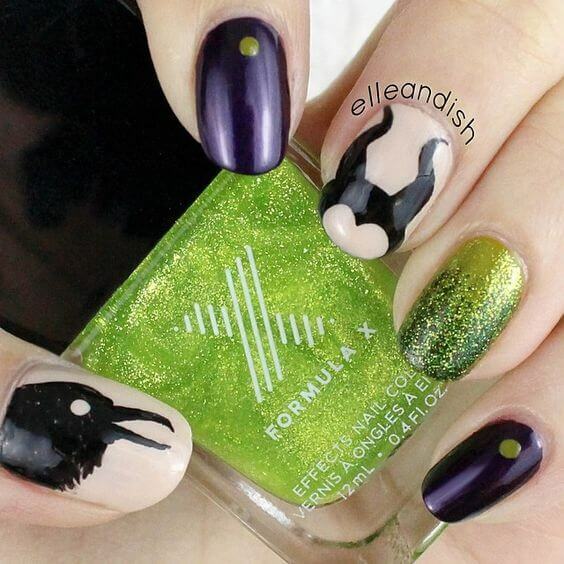 Another unique and creative nail art featuring Maleficent and her pet Raven. 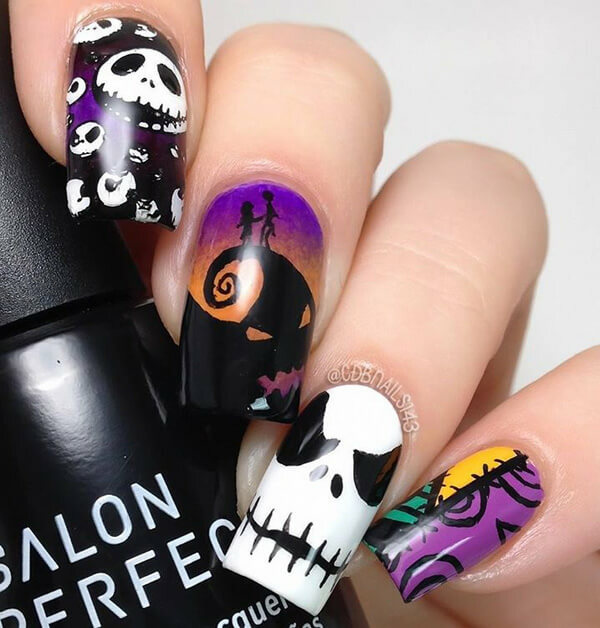 This would be one of your most favorite Halloween nail art ideas for 2017. Jack-o-lanterns are not always cute. Sometimes, they can be terrifying too, as seen in this picture. We think it’s a nice break from the regular, cute ones. 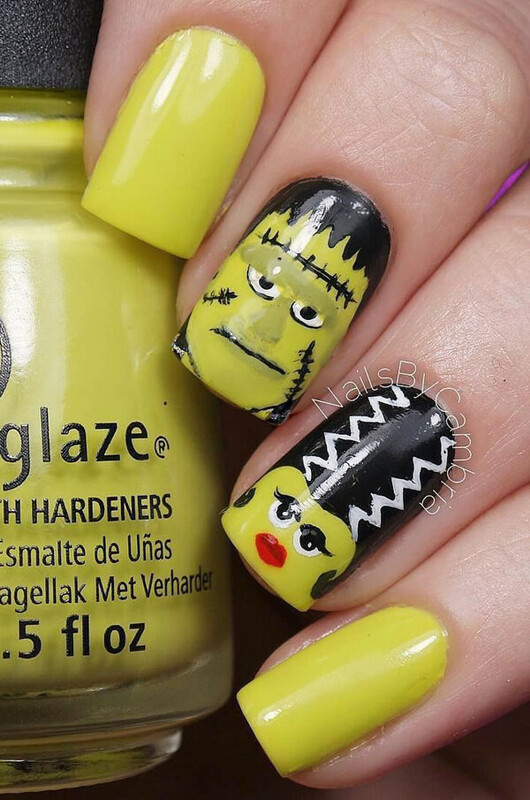 This nail art features Frankenstein and his beloved. Both of them look a bit serious here. What could be the reason? 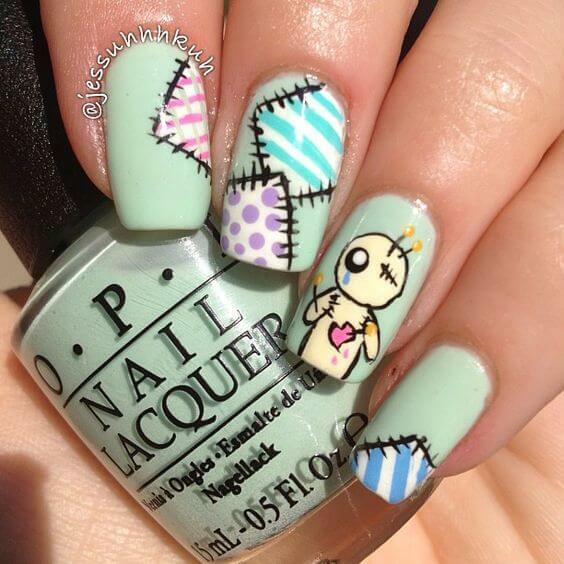 Here’s an absolutely adorable nail art idea for you to refer. 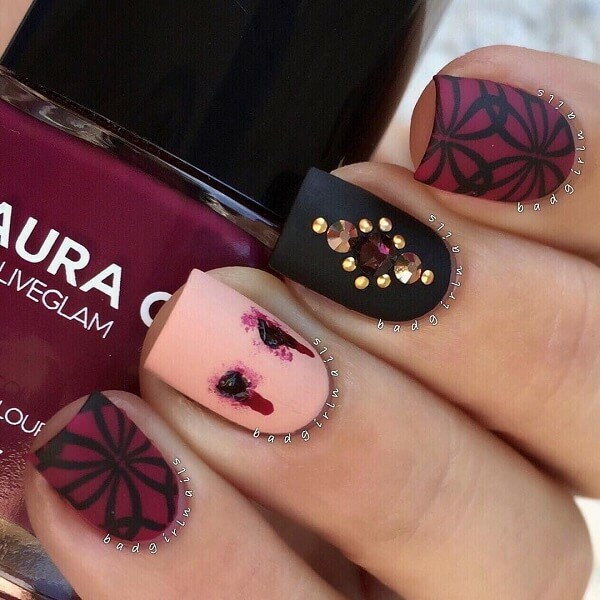 We loved the color used in this nail art. 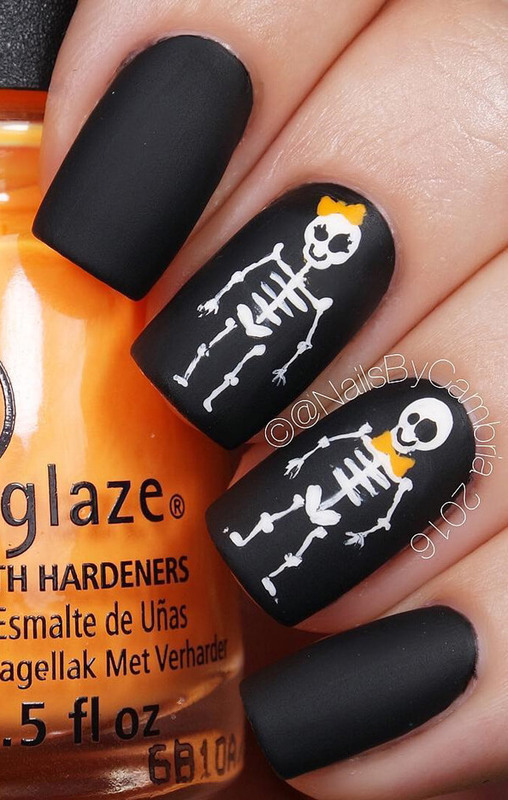 This is one of the creepiest Halloween nail arts we’ve come across. And we must say it’s been done meticulously. We adore it. 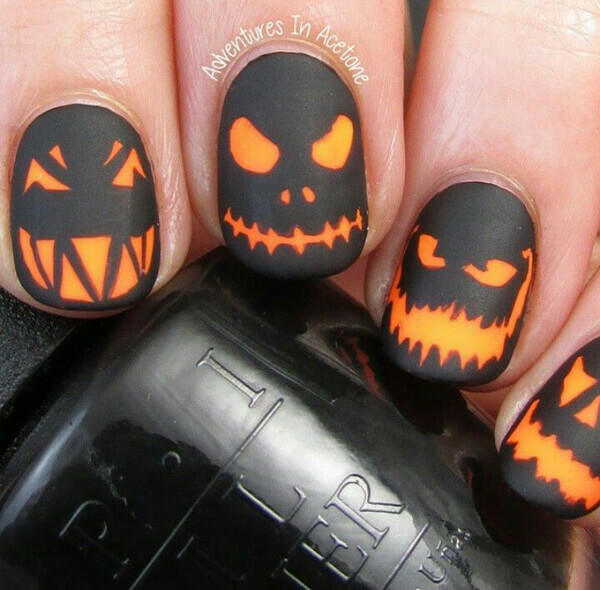 Here’s another unique and different Halloween nail art idea. 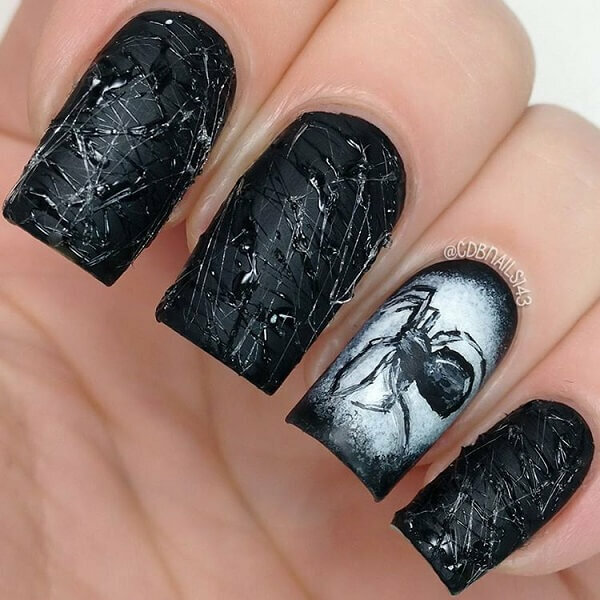 The statement nail features the spider and the rest of them have web. We particularly loved the 3D webs. 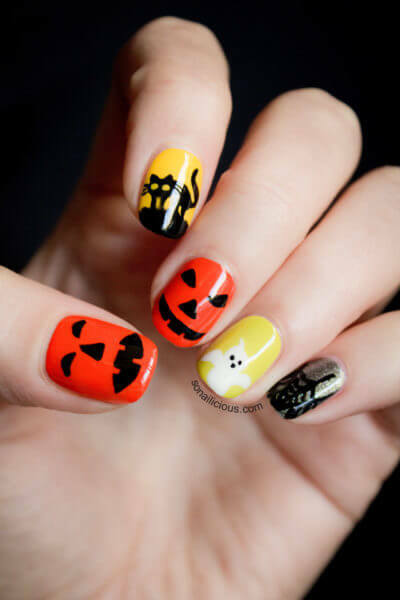 Since trick-or-treat play a vital role in the Halloween, display the same on your nail art too. 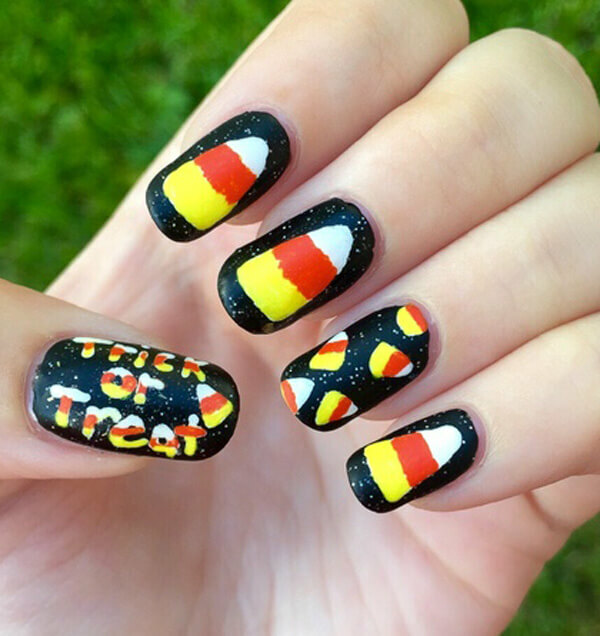 This nail art features candy corns and wordings ‘trick or treat’ on the thumb.